To never lose sight of the beautiful and personal relationship we share with our animal friends. To improve animal health and longevity through prevention and through advanced medical and surgical treatments. To recognize that we are specialized and unique stewards, along with our clients, to defend, treat, provide for, love, and support our animal patients. To always be cognizant of the medical fact that pets improve the quality of human life. To educate and support our clients in their decisions in providing for their much beloved cherished pets. To make our patients and clients comfortable and happy by serving their needs in our own unique, heartfelt style that surpasses all of their expectations. 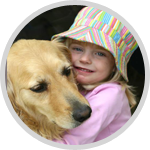 Since 2005, we have called The Cooke Veterinary Medical Center ‘The Place for Healing’. After graduating veterinary school and practicing for 9 years, Dr. Denette Cooke found that many dogs and cats in pain were not helped by conventional medications and treatments. So she began to explore other options to help eliminate pain and increase mobility. She studied under Dr. Huisheng Xie, clinical associate professor at the University of Florida College of Veterinary Medicine, and the founder of the Chi Institute of Traditional Chinese Veterinary Medicine in Reddick, Florida. While no medicine or treatment is 100%, our approach to a multi-modal approach of medical treatments, certainly does work better than any individual approach on its own. We like to think of our method of medicine as ‘carrying 2 black doctors’ bags’. From the newest Western advancement of a surgical technique or a new medication, to ancient evidence-based medicine such as acupuncture, food therapies, massage and herbals, we provide the treatment options that are best for the patient and the client. We do this by providing, first and foremost, a good Western diagnostic approach to know what disease process or processes the patient may be facing. Then we integrate all treatment options that may be helpful. A pet with back pain and arthritis, an extremely common issue with senior pets, may be recommended weight loss, joint supplements, arthritis injections, non-steroidal anti-inflammatory drugs (NSAIDs), Western pain medications, herbals, cold laser, food therapy, and/or acupuncture depending on the presentation. We are fortunate that we do not have to choose only one treatment option! This approach makes The Cooke Veterinary Medical Center extremely unique and special!